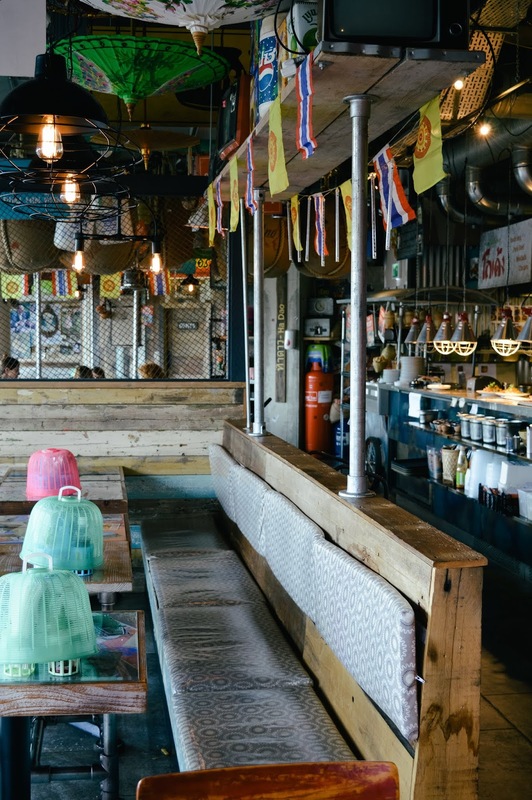 Nestled in the heart of Southampton lives Thaikhun - a Thai street food inspired restaurant which mimics the bustle of the busy streets in Bangkok with authentic decor, busy kitchen, all of the food smells you could ever want to tantalise your taste buds. 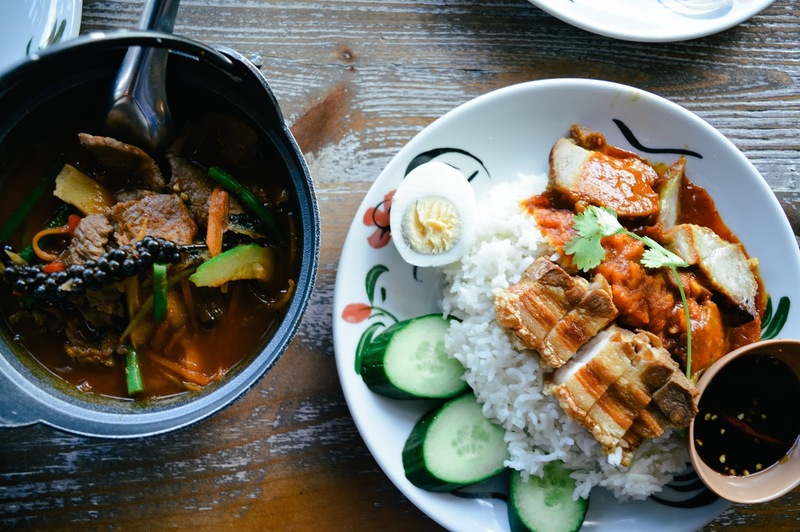 I was introduced to Thai food properly by my fiancé who has visited Thailand and is a big fan of the country, as well as Thai cuisine. 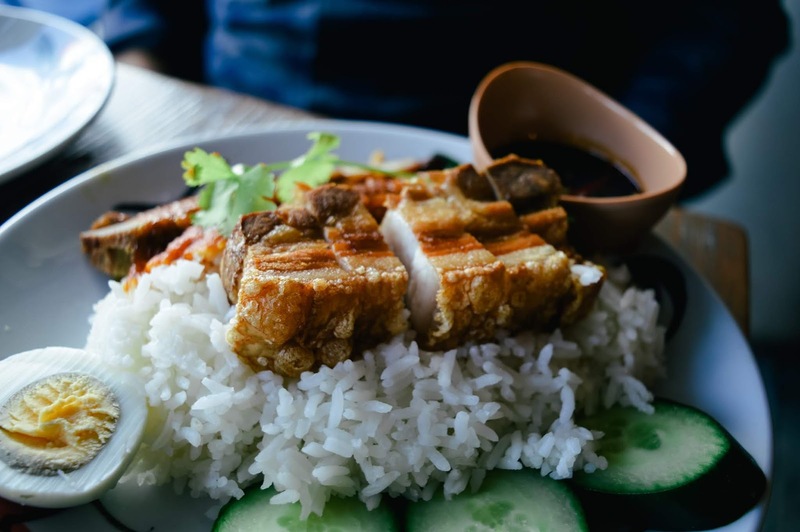 Although I have always liked Thai dishes, I used to always go for the safe option of Thai Green Curry but since then discovered some new favourite dishes. 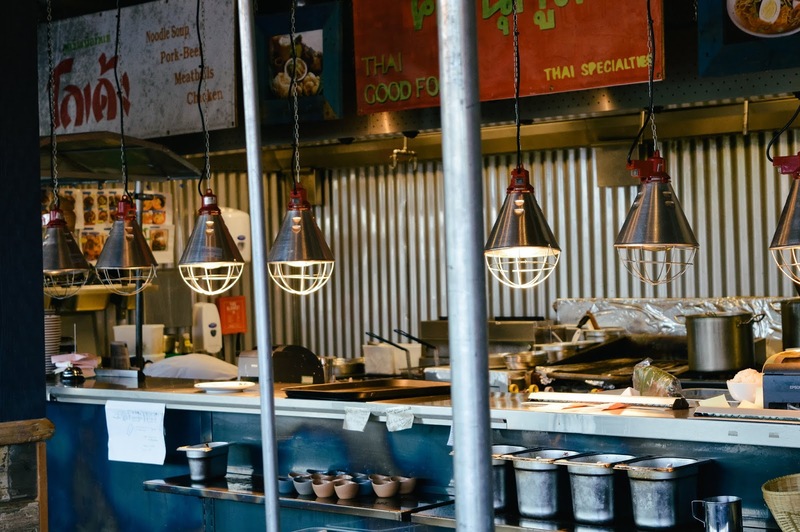 I was really excited to have been introduced to Thaikhun which is known for their authentic Thai street food style - isn't street food the best? 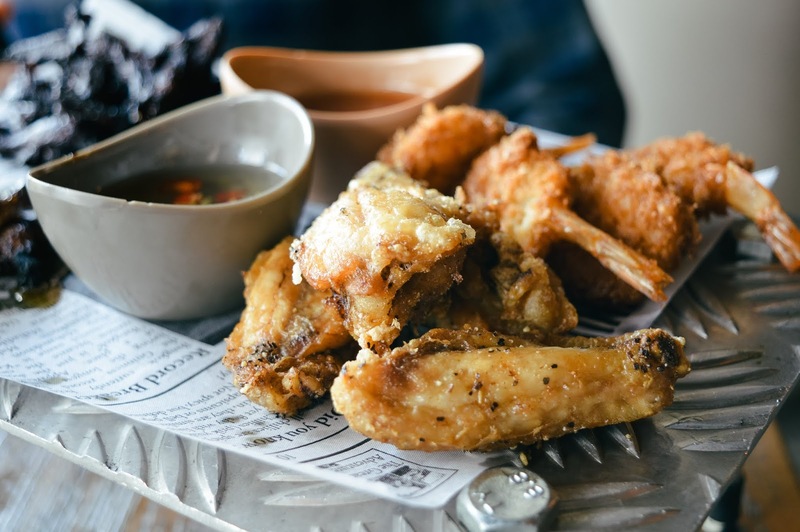 I love going to food festivals and exploring street food on our travels abroad or even to different parts of the UK. 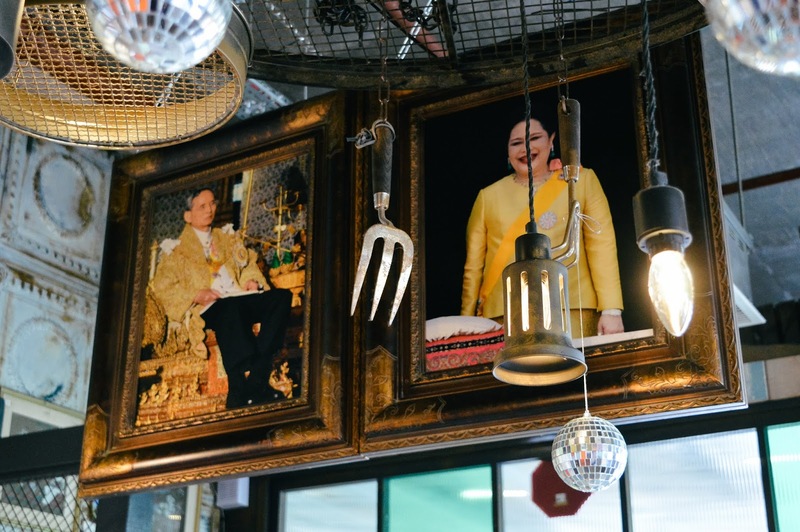 The decor inside Thaikhun was perfect for their theme - authentic Thai signs, paintings of the royal family, and even baskets covering the cutlery stands which is what they do in Thailand to prevent flies and bugs from landing on them! 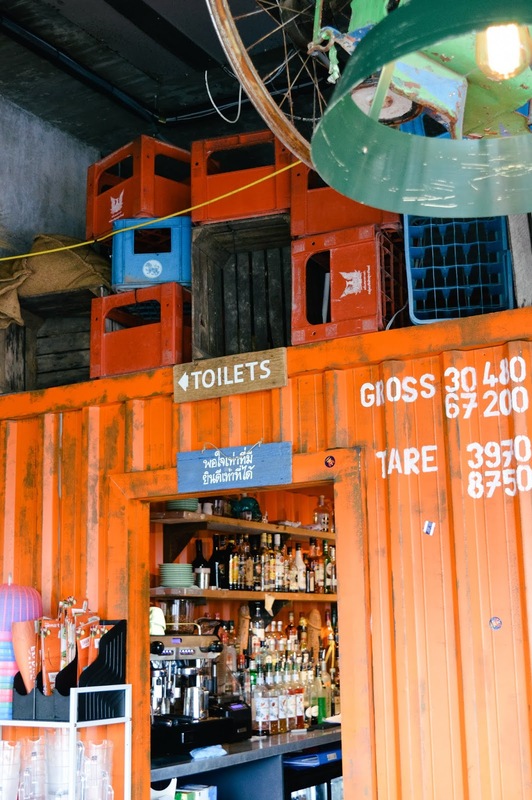 It's the little touches which made you feel like you were abroad - I have never been to Thailand, although I would love to I think the plane journey will literally kill me as a phobic, but Liam said it was just like the real deal. 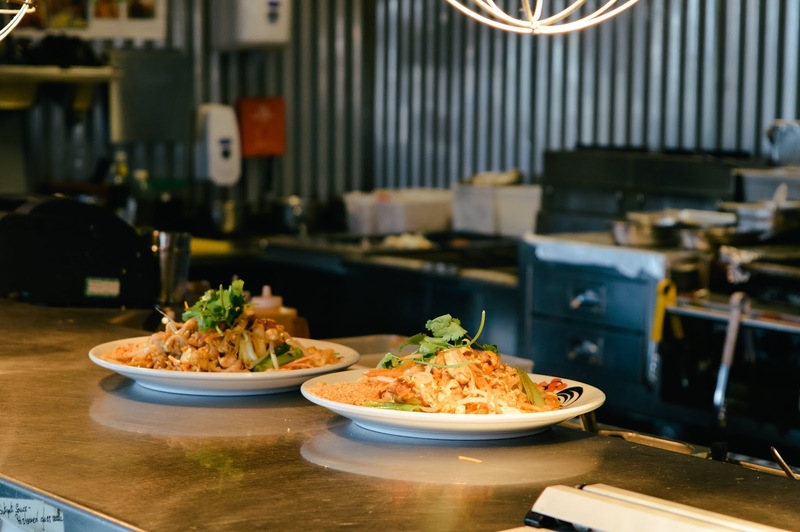 I also love an open kitchen in a restaurant where you can get a glimpse into what goes on and how dishes are prepared - it's the snoop in me that wants to see other dishes and how they're made, what ingredients are included, and the techniques used. 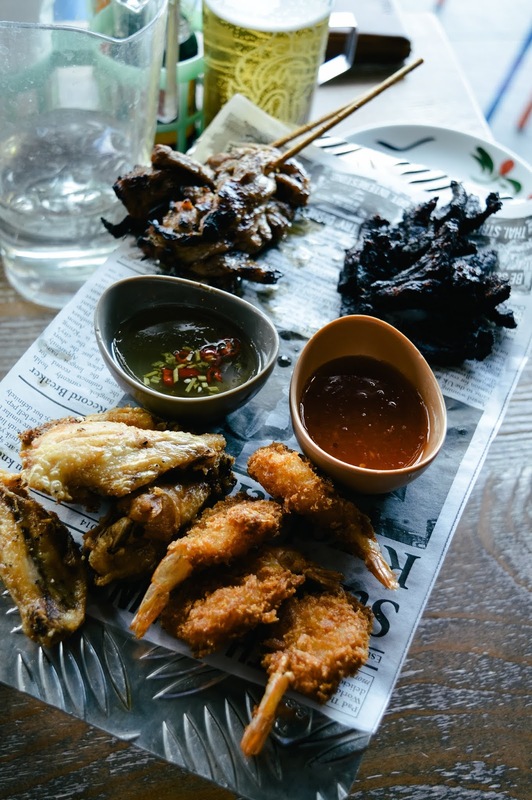 We kicked off our Thai banquet with the Atchara Sharing Platter which included breaded prawns, pork skewers, fried beef and chicken wings inspired by the night street food market in Sukhumvit 38 in Bangkok. I love sharing tasting platters as you get a little bit of everything - the Atchara platter was delicious. 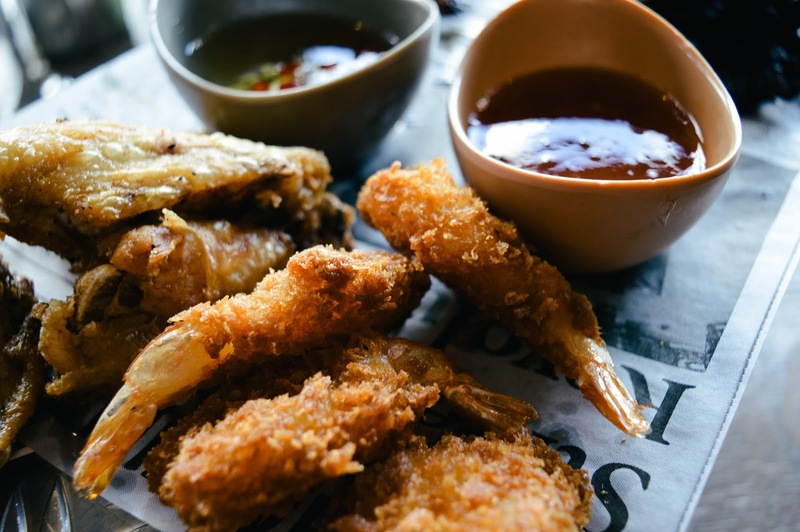 Everything on there was so tasty - crispy prawns dipped into chilli sauce; grilled pork skewers which tasted smokey and fresh; chicken wings with chilli sauce is a delicious staple; and fried beef with was soft yet somewhat resembled jerky - full of flavour, lean, delicious. 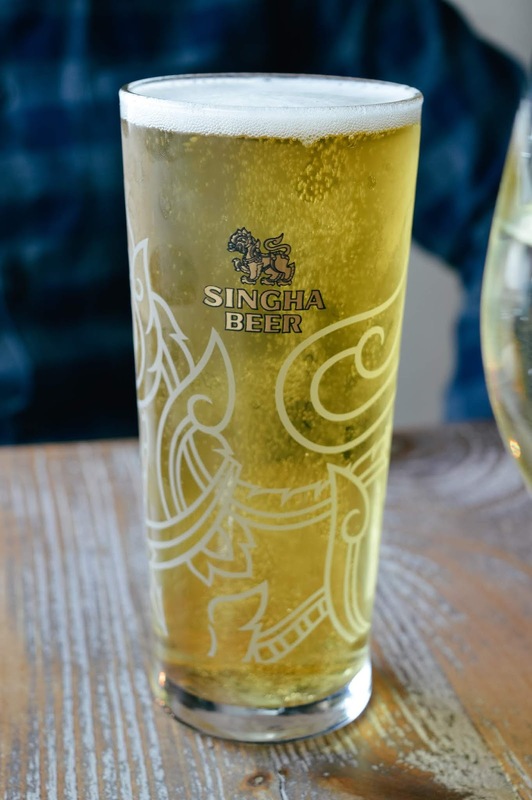 This platter is perfect with a glass of Singha beer and shared with friends over an overdue catch up! 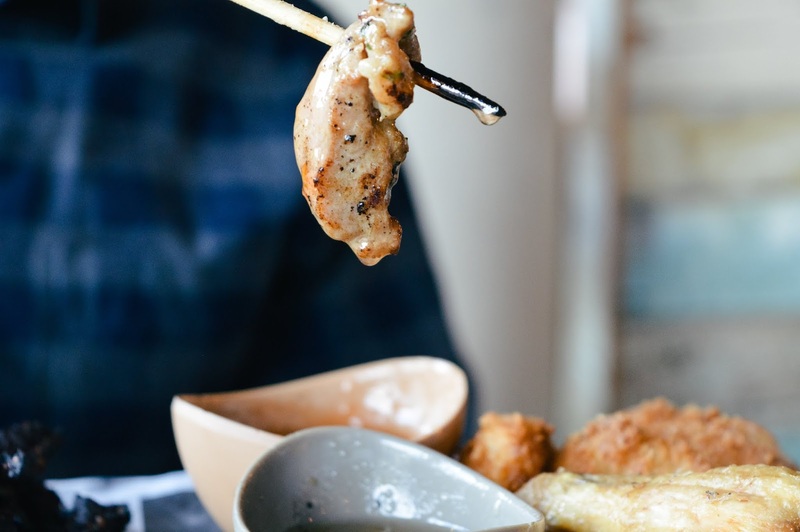 We moved on to our starters which were Thai Fishcakes and the must-have Tom Yum Soup with prawns. The fishcakes were my favourite fishcakes ever - soft and full of flavour, the fish was blended with green beans, lime leaves, and red curry. Definitely going to try and recreate these at home, and if I fail I know where to go to get my kick! 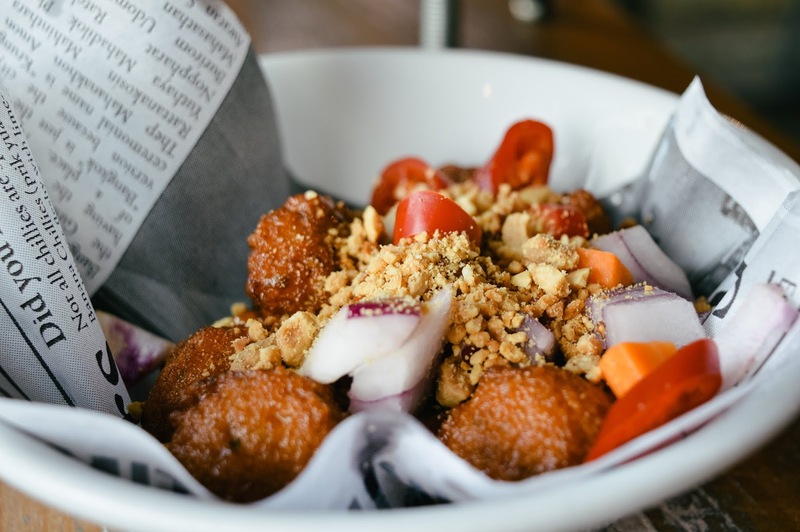 They were served with cucumber relish, sweet chilli sauce, and crushed peanuts which added different textures to the dish. 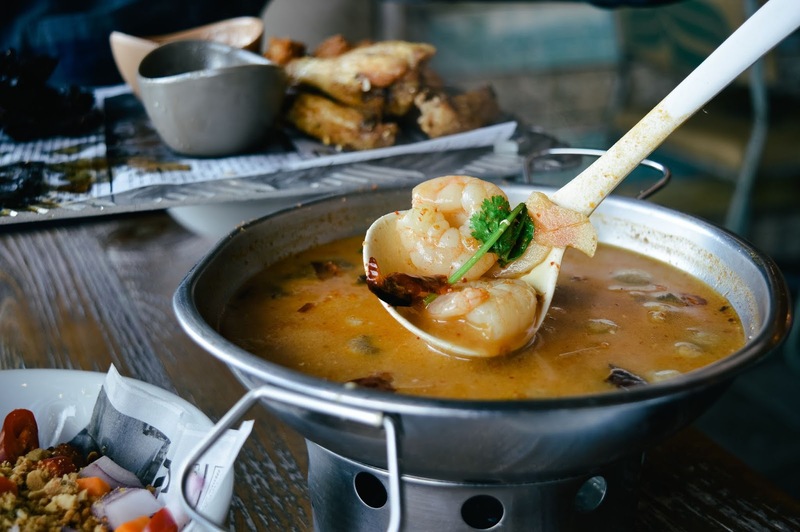 My favourite soup is Tom Yum without fail - I always order it in Thai restaurants and make it at home. 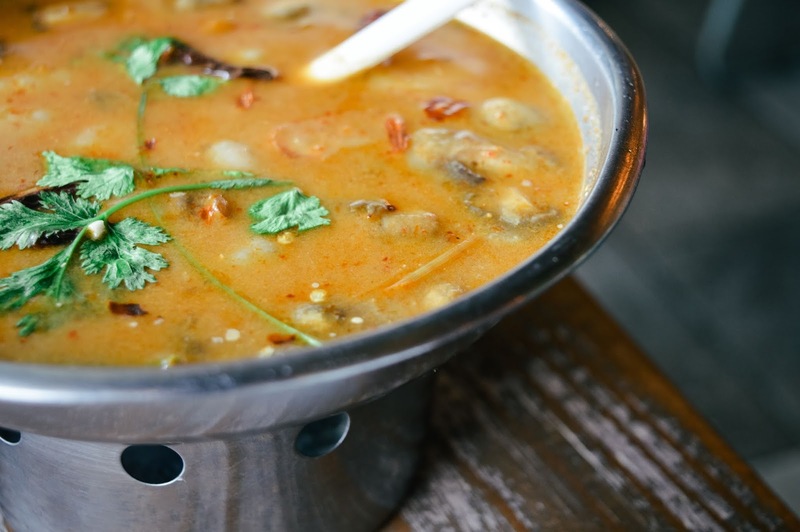 I love how hot and sour this soup is - the perfect combination for me because I love spicy and sour tastes. 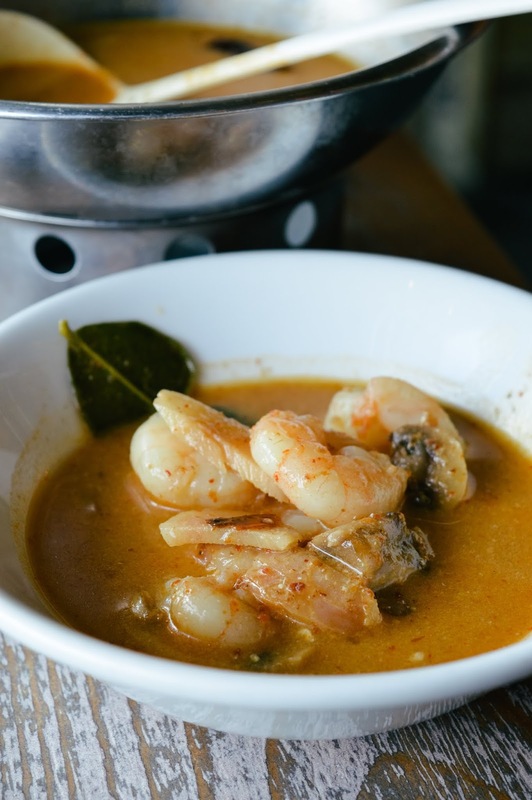 The soup is made with lemongrass, galangal, roasted chillies, lime leaves, and flavoured with Thai herbs. Then you can add either chicken, vegetables, or prawns (my choice!) and enjoy hot with some fresh coriander topping your bowl. The Tom Yum soup was absolutely delicious - flavours were balanced nicely and there was a good spicy kick which isn't overpowering. After a nice break before our main course, we were ready to sample more delicious dishes. 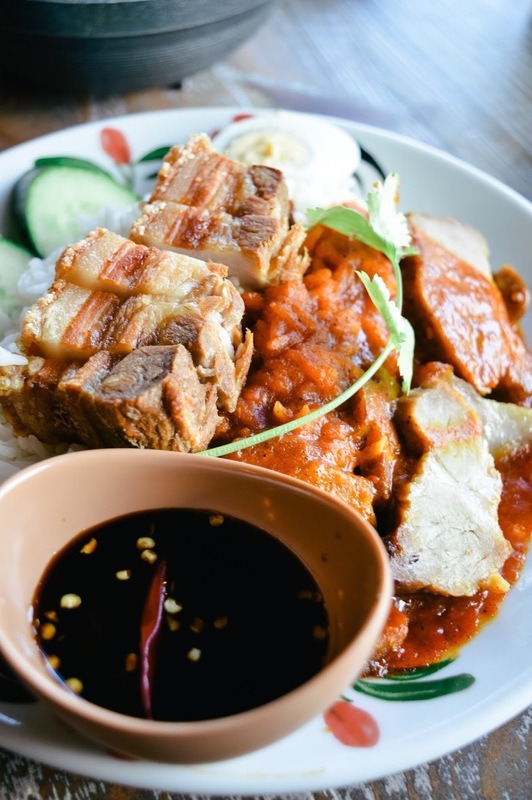 For mains we ordered Barbecued Pork on Rice and Beef Jungle Curry. 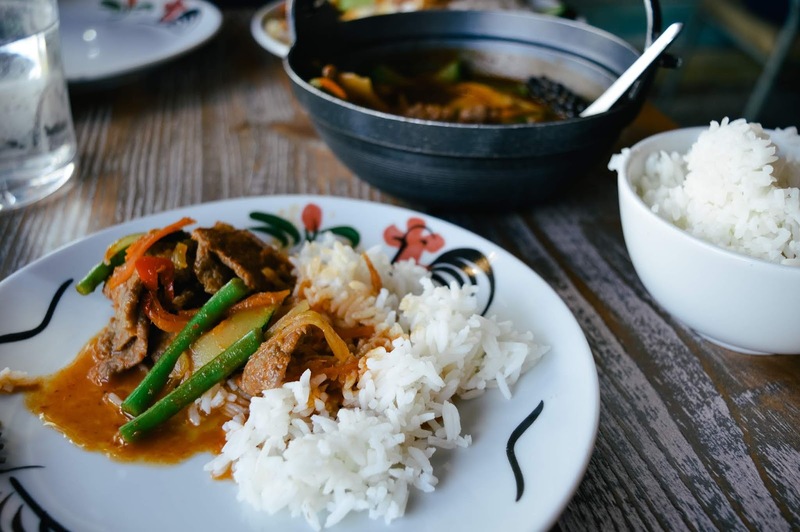 We have worked out a brilliant system with Liam - we order food that we like, but because we have similar tastes and just love food altogether we swap meals halfway through to enjoy more flavours and dishes. Does anyone else do that? It's a brilliant idea! 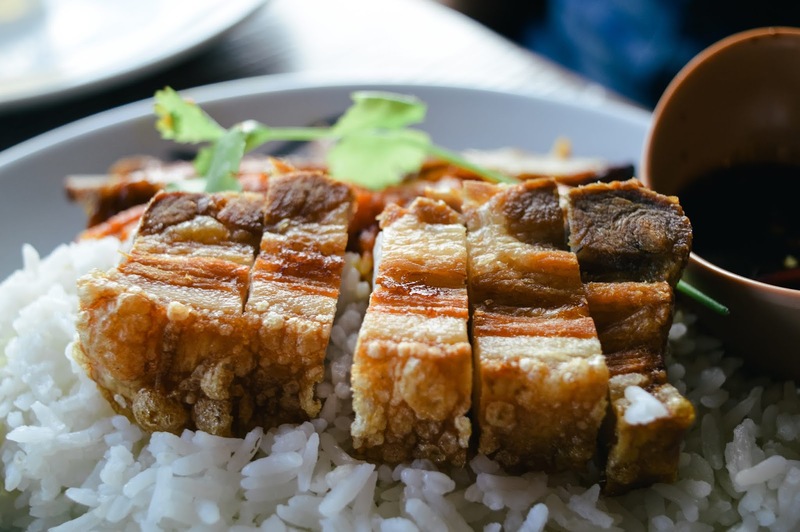 The BBQ pork belly was delicious - soft and tender, perfectly balanced by the freshness of cucumber and sweet soy sauce. 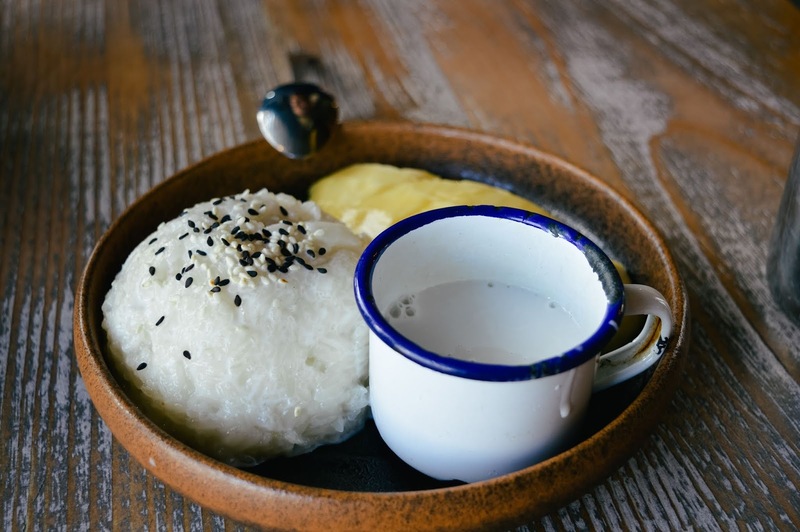 It was a full on protein meal with egg and rice - you won't go hungry after that! 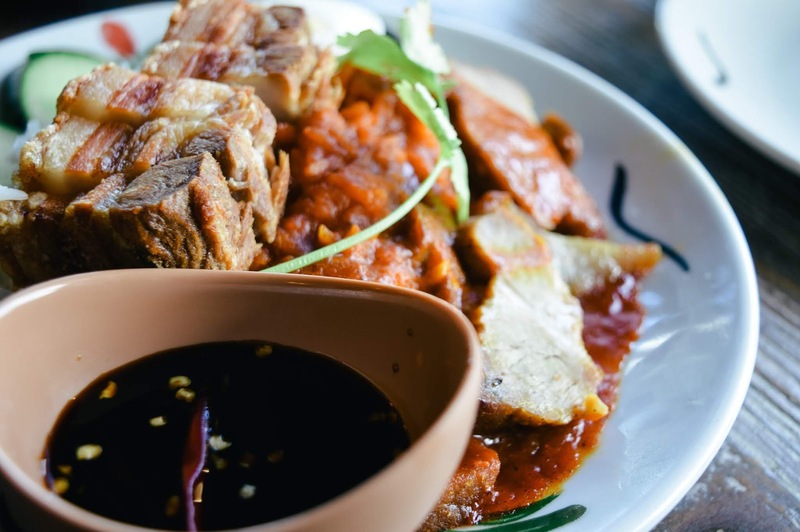 I really enjoyed the flavours of the pork and how it was cooked - sometimes pork belly can be a little on the greasy side but this was soft and delicious. The sweetness of the soy sauce was perfect with it too - it had just a little hint of spice in there to cut through the sweet which was perfect. 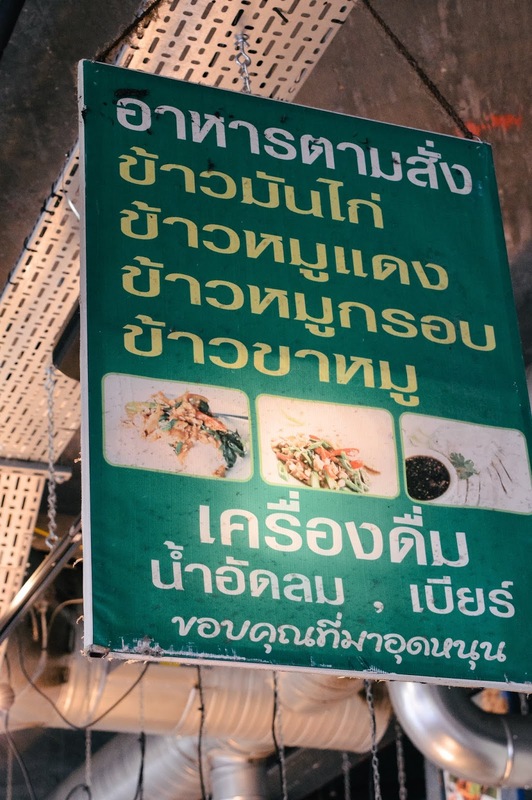 I absolutely had to have the Jungle Curry - a Thai favourite of mine. 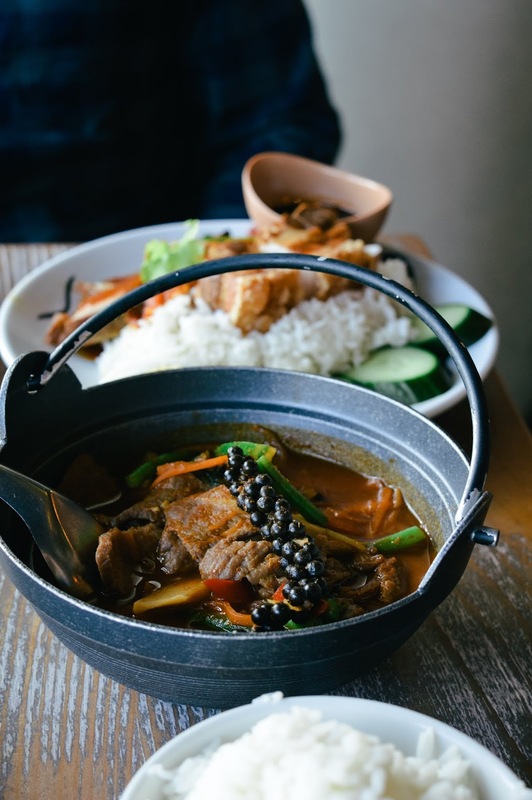 It's usually the spiciest curry on the menu and I LOVE spicy food, especially curries. But the key is to have spice and taste because sometimes too much spice can just kill and flavour. 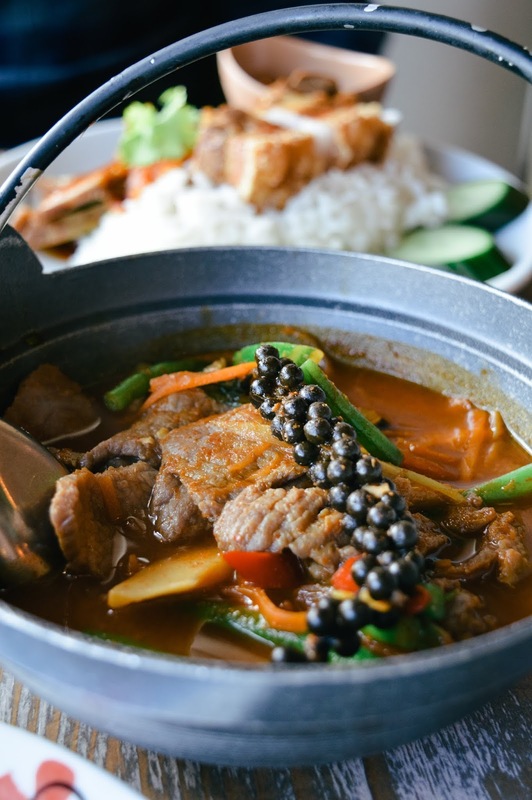 We ordered the beef curry but you have the option of chicken, pork, duck, prawn, vegetable, or tofu - so there is something for everyone. 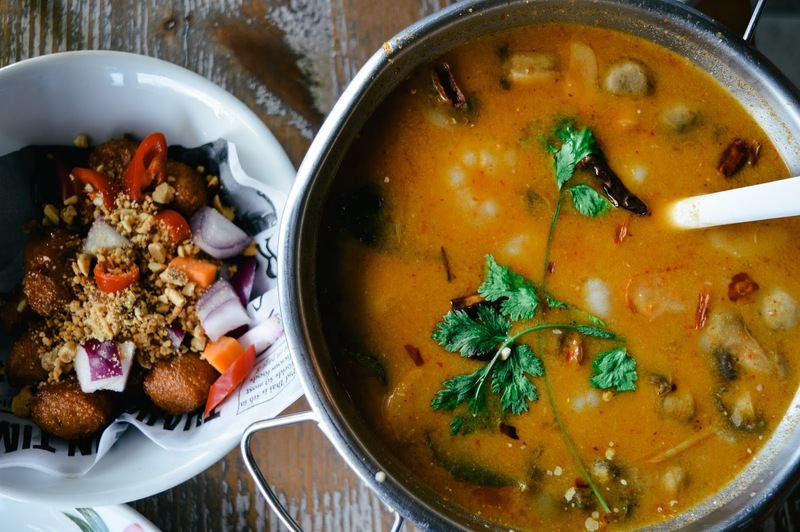 The curry is made with bamboo, carrot, mushroom, papaya, green beans, kra chai (a relative of ginger), spring greens and basil. YUM. What a delicious explosion of flavours! 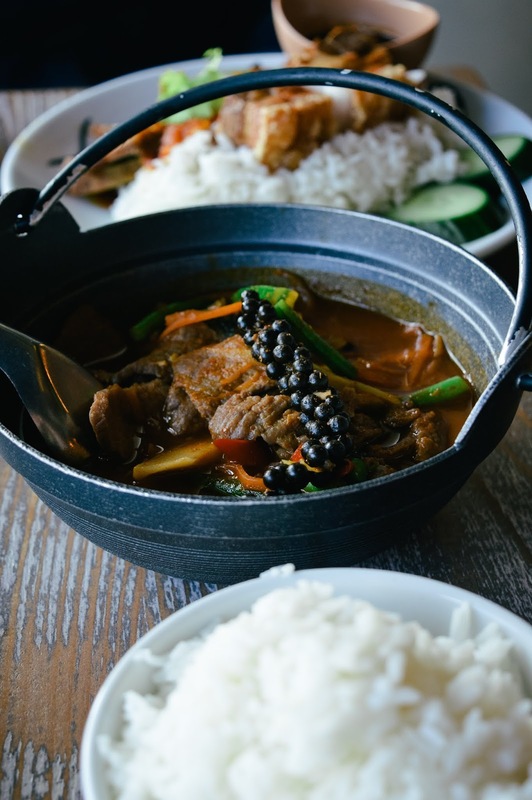 I really enjoyed the Jungle Curry - not only was it a great level of spice for me (you could feel the burn) but it was packed with flavour and soothed by fluffy rice. I had a Jungle Curry once before and it blew my head off, but this dish is perfect for those who enjoy spice. 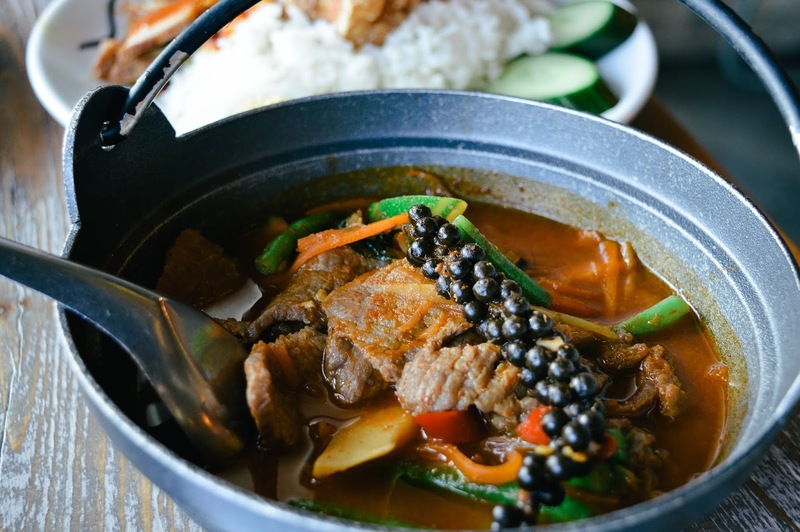 If you're not good with spice, then go for a milder curry on the menu. 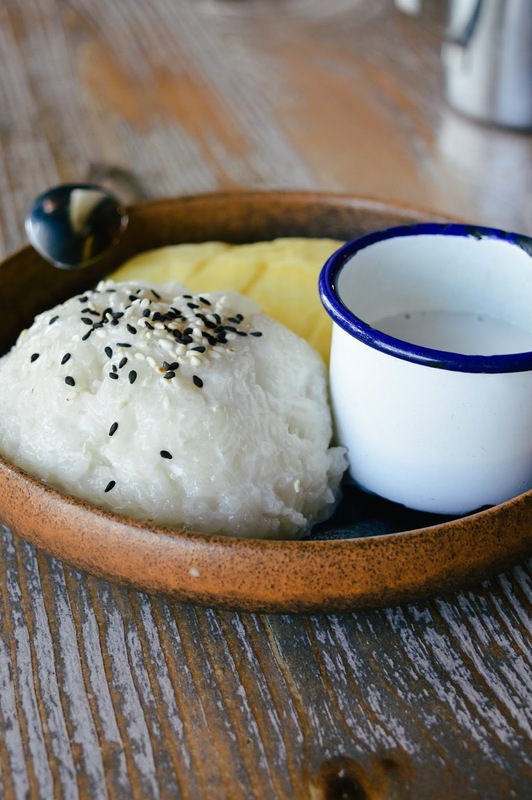 We finished out Thai foodie adventures with Mango and Coconut Rice which was Liams favourite street dessert - we had one to share between the two of us because we were stuffed after such a delicious feast. I think finishing the meal with a light and fresh dessert that includes fruit is ideal, especially for those who are more savoury than sweet tooth (like me!). 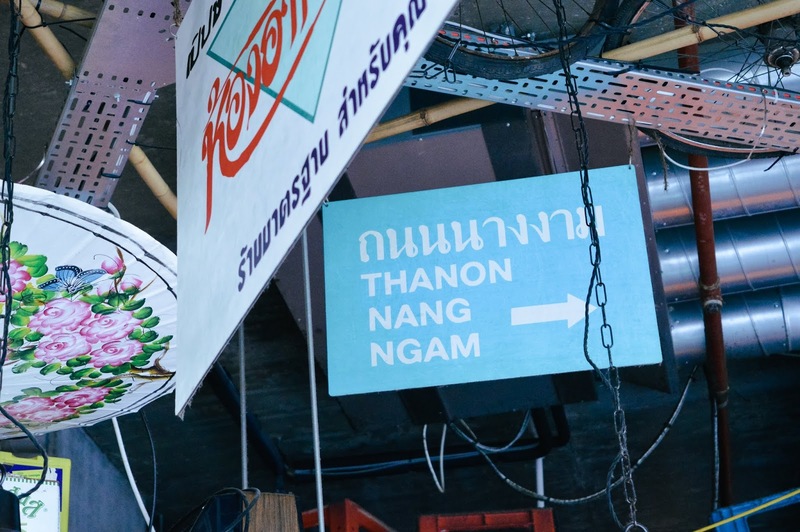 We loved our trip to Thaikhun and no doubt will be back again soon because the food is 10/10, delicious, authentic. 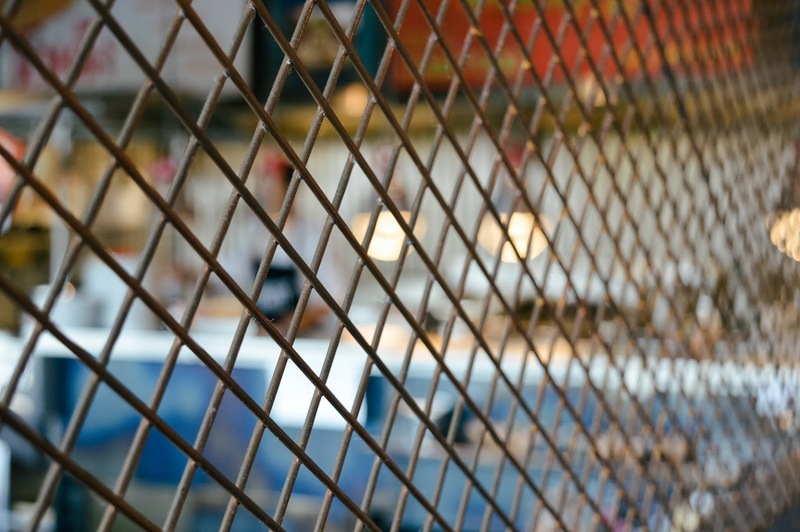 I would highly recommend going there for the food and the atmosphere, and brilliant service from the friendly team. 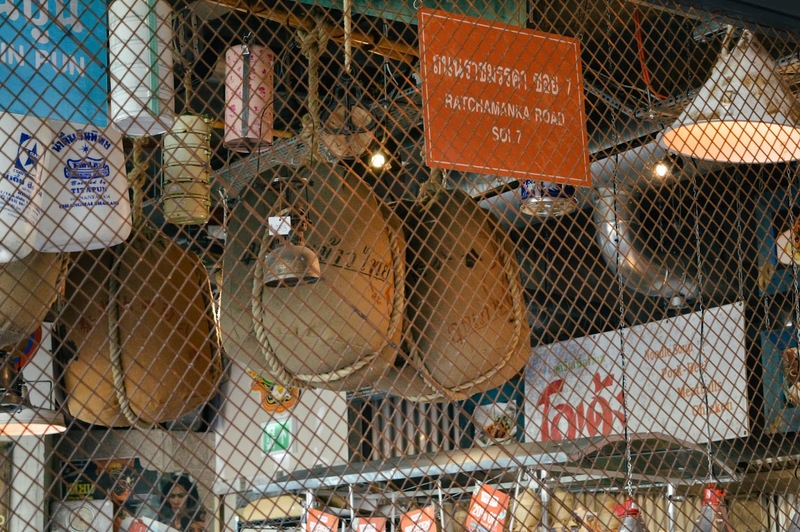 *The food and drink featured in this post was complimentary for review purposes from Thainkhun. All views are my own.